The ordination of bishop Susitino Sionepoe took place on 24 March in the cathedral of Mata’Utu, the capital of Wallis et Futuna. Those present included representatives of local authorities and a delegation from the government of New Caledonia including the president, M. Philippe Germain. The principal celebrant was bishop Michel Calvet, archbishop of Noumea. He was assisted by bishop John Bosco Baremes of Port-Vila, bishop emeritus of Wallis-Futuna, Ghislain de Rasilly and several other bishops. The Society of Mary’s provincial and vicar provincial for the province of Oceania were also present as were many Marists, diocesan and religious priests and a big congregation of faithful. A special delegation, 200 people, came from New Caledonia, where Susitino has served in parishes for more than 15 years. A great feast followed a solemn mass. On Monday 25 March the bishop celebrated a thanksgiving mass at Hihifo. Susitino who was born on January 4, 1965 and comes from the village of Vaitupu in Hihifo. He is the second bishop of Wallis and Futuna to be born there. After his priestly ordination, Susitino worked in parishes in the diocese of Tonga and Niue between 1994 and 1995. He then moved to New Caledonia where he worked in parishes from 1996 to 2006. In 2006 and 2007, he attended the Year of Formation in Ministries (AFM) at the Catholic Institute of Paris. On his return to New Caledonia, he continued to work in parishes until 2012. 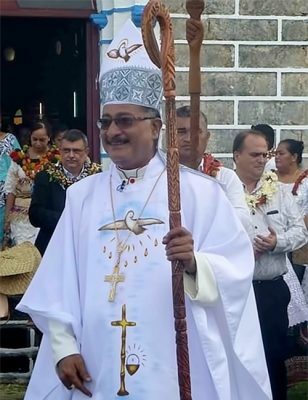 From 2012 till 2018 Susitino was the vicar provincial of the Oceania province of the Society of Mary residing in Suva, and religious superior of Marists of Wallis and Futuna. At the time he was appointed the bishop of Wallis and Futuna he was working in parish ministry with the community of Marist Fathers in Yate in New Caledonia.